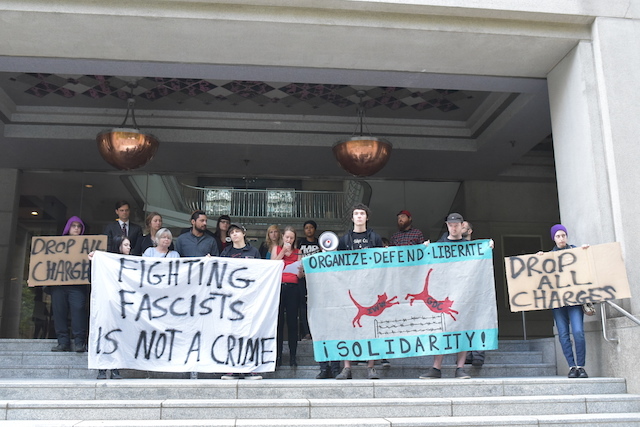 Kelly Baur and Jeremy Ibarra, who were arrested during the police crackdown on anti-fascism activists following the June 4 white supremacy rally in Terry Schrunk Plaza, both entered pleas of not guilty on August 17 to the charges brought against them. In doing so, they rejected a plea deal and demanded a trial by jury. Baur, one of 14 people arrested during the rally, has been charged with interfering with a peace officer, disorderly conduct in the second degree, and resisting arrest. Ibarra’s sole charge is second degree disorderly conduct. 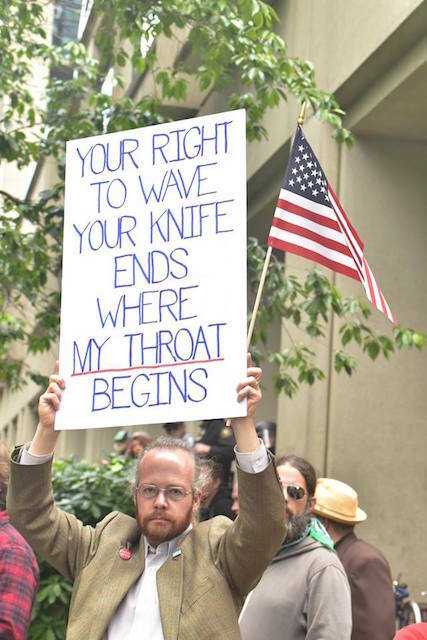 The June 4 rally occurred just 9 days after Jeremy Christian verbally abused two young Black women whom he believed were Muslims on a MAX train and subsequently stabbed three men who intervened, murdering two of them. Since then, white supremacists throughout the country have found themselves even more emboldened in expressing their ideology, culminating in the horrific events in Charlottesville, Virginia two weekends ago which included a Friday night torchlight rally complete with anti-Semitic chants and Nazi salutes. The following day, a crowd of white supremacists brutally beat DeAndre Harris, a 20 year old Black man who resided in Charlottesville. Even more horrifically, white supremacist James Alex Fields, Jr. plowed his car into a crowd anti-fascism protesters, murdering Heather Heyer and injuring 19 others. As during the June 4 rally in Portland, as well as a similar late-April white supremacist event in the Montavilla neighborhood, police in Charlottesville facilitated the white supremacists gathering together and spewing their hateful ideology. 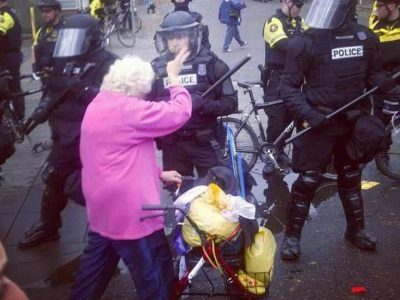 Their coddling of the fascists presented a marked contrast to the violence they have brought upon Black Lives Matter protesters and other justice activists such as seen during their assault on participants in Portland’s May Day parade where the Portland police from point one were out to intimidate participants and eventually inflicted collective punishment upon them after a few young people broke some windows and set fire to a traffic control pillar. 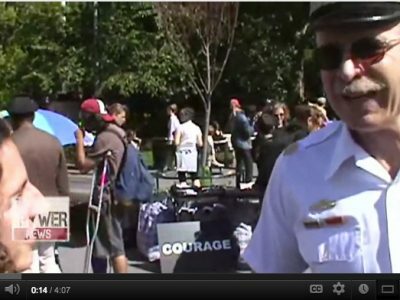 As well, during the June 4 rally, police worked with white supremacist militia groups, one of whose members helped a police officer take down and arrest an anti-fascist protester. Such tactics are often defended as part of preserving the white supremacists’ Constitutionally protected right to free speech. But what, may we ask, is free speech from a police perspective? 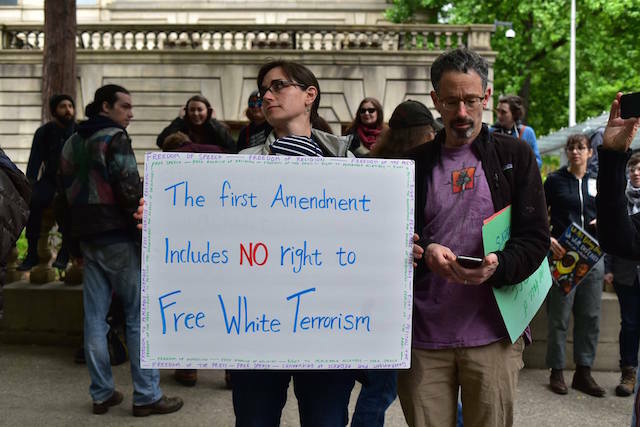 And why do the Portland police defend white supremacists’ First Amendment rights more fervently than the free speech rights of those opposed to fascism? “Free speech that equals violence is not free speech. 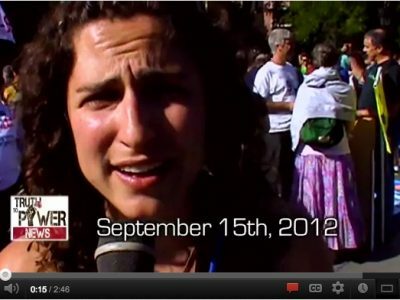 It’s terrorism in its rawest form,” said Teressa Raiford of Don’t Shoot Portland. White supremacy and its accompanying racism and bigotry are clearly nothing new to the US. In fact, white supremacy is the country’s foundation. 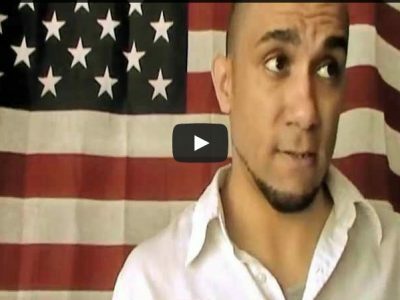 The US was built on land stolen from indigenous people and the unpaid slave labor of Africans. Republican Donald Trump’s victory in the 2016 presidential election despite his racism–he began his campaign by implying that most Mexican immigrants were rapists, and continued from there–was only the most recent iteration of white supremacy, though it is the most obvious in many generations. His statements following the events in Charlottesville should make it obvious that Trump not only supports white supremacy, but does so quite vocally. While seeing Nazis march in the streets is certainly horrifying and must be vigorously challenged, it is the institutional forms of white supremacy, such as can be found in police departments whose role in society is to contain and control resistance, that pose a deeper threat and give power to Nazis and other white supremacist groups. Katy Kates of the Portland Industrial Workers of the World General Defense Committee noted the role police play in upholding white supremacy. Charlottesville, it appears, may be be a tipping point for many in the US, particularly white people, who have stayed on the sidelines following Donald Trump’s election, despite the drastic increase in racist and bigoted incidents and crimes that have followed his ascension to the presidency. Baur, whose trial (along with Ibarra’s) begins on September 8, noted that there was no better moment than now to get involved in organizing against white supremacy and working toward its abolition.